Were it not for the unexpected tightness of some of the corners and the pit building that rises monolithically from the sporting fields, you could easily spend most of the year driving around Albert Park Lake completely unaware that you are on an active Grand Prix circuit. There are no grandstands, no overpasses, and no advertising. Small wooden fence posts linked to one another with chain run along the roadside in place of the massive steel and concrete crash barriers that prevent errant car parts entering the crowd after something has gone amiss during the race. 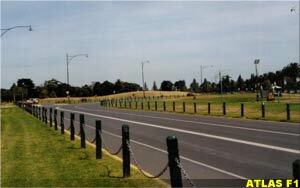 People rollerblade or play basketball at the entrance to the pitlane (which is somewhat optimistically renamed the 'Albert Park Play Lane' during non-GP periods), while others use the aquatic centre, rowing clubs, golf course, soccer stadium, and small sporting fields that are crowded into the park precinct. Converting a large area of parkland into a venue capable of handling the demands of Formula One, and all it brings with it, is no small task. To help you get some feeling for the transformation that the park undergoes each year in preparation for the first weekend in March, I made regular visits to the track between the middle of January and late February to track how the work progressed. The race circuit is comprised of two major roads - Aughtie Drive, which encompasses the start/finish straight as it runs between Turn 14 and Turn 5, and Lakeside Drive, which extends from Turn 6 to Turn 13. 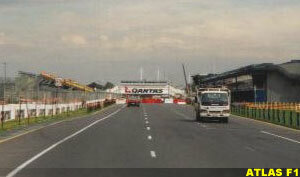 Albert Park Drive serves as the short blast between Turns 5 and 6, while Ross Gregory Drive connects Turns 13 and 14 to complete the track. 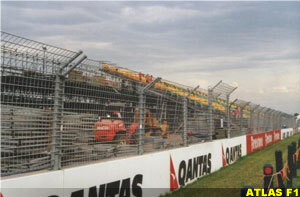 The Australian Grand Prix Corporation is permitted to begin preparing the circuit for the race in mid-December. Naturally, they use all the time that they have available to them (actually, it's been reported in the past they have tried to be sneaky and start a little earlier on a couple of occasions), but it is not until January that the first really obvious pieces of race infrastructure begin to appear. While at this early stage there is little to see, it is obvious that something is afoot, although all attention has thus far been directed towards Aughtie Drive. Strings of orange construction site flags flutter in the breeze at seemingly random spots around the lake, while small trucks and vans buzz importantly up and down the roads. Steel frames have begun to sprout from the grass-like bamboo forests, marking out the first signs of grandstands and corporate boxes. At this stage, it's still possible to climb the stairs up toward the podium without being intercepted by a large security guard wearing mirrored sunglasses. It's been two weeks since my last visit, and much progress has been made. The most obvious sign of things to come is the massive Qantas arch that straddles the main straight just past the start/finish line and pitlane exit. By far the biggest overpass at the circuit, the arch is already in place by the end of January and stands watch over the happenings along the main straight for the next month. The skeletal frame along the main straight has started to sprout seats - the large Fangio stand is approximately half complete. Tangles of scaffolding elsewhere along the southern part of the track suggest the beginnings of most of the other stands, though there is no sign yet of the Prost stand, which is located at the final corner. 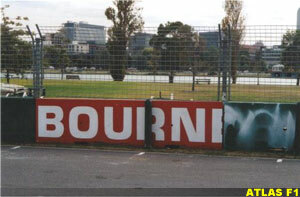 Rows of tyre barriers mark out the boundaries of runoff areas at Turn 2 and 3, but the area is still grassed. Across the road though, some of the corporate boxes appear to be near completion. Some of the concrete barriers are in position, though some have not yet been fitted with steel mesh, and all of them need painting. Turn 4 doesn't exist yet. During the non-race part of the year, the area between Turns 3 and 5 are linked by a narrow service road infested with speed humps that runs alongside a carpark. When this section is reconfigured for the race, the service road is closed off and the track is redirected through the parking area. Plastic barriers mark the route that the track will take in a few weeks time, but for the time being this part remains closed. Further along, the small corporate stands at Turn 5 appear to be half complete. Heading along the leafy straight between Turns 5 and 6, I encounter an army of workmen and trucks who are busy setting up more concrete barriers. The incessant beeping of trucks reversing against a background of steadily chattering sprinklers creates a feeling that all these guys in hard hats and fluorescent jackets are labouring to a soundtrack created by a cheap 1980s synthesizer. A stark white pedestrian overpass has been set up and awaits painting. Except for the humble beginnings of a small corporate box, Turn 6 is virtually untouched. By the end of the first week of February, though, the concrete barriers have extended about halfway along Lakeside Drive. The Turn 9/10 sequence has not been installed yet - for most of the year, the road traces a virtually uninterrupted sweep that, if left unchecked, would mean that the drivers would have a sweeping sixth gear blast from Turn 6 all the way up to Turn 11. Instead, the race configuration sees the road diverted through a small car park to create a chicane that looks like a paperclip that someone has bent out of shape. If you happen to be attending the race with a General Admission ticket, this is one of the best viewing positions. With the exception of some scaffolding that will soon become grandstands and corporate facilities, there is little race infrastructure in place between the chicane and Turn 13. A proliferation of small orange flags suggests that this will soon change. The entry/exit tower frames of several overpasses stand sentry over different sections of the circuit, while the other parts of the structures are heaped in the grass nearby. 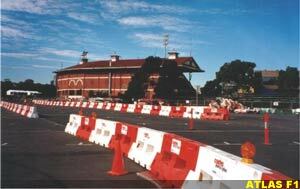 Most of the concrete barriers around the circuit are in place, but they are still waiting for a new paint job. Most are just plain green, though some bear segments of advertising billboards from years gone by. Amazingly, one piece located at the end of the Turn 2 gravel trap still bears markings from Adelaide. The area is starting to feel like a race circuit now, and security has been bumped up accordingly. For the first time this year, I spot a security guy on a bike, a sight that becomes more and more common as the race looms nearer. Near Turn 3, a huge crane is maneuvering the main section of an overpass into position. All of the gravel traps have been marked out with tyres, but none have been installed yet. The race is a little over two weeks away. All the grandstands and corporate facilities appear close to completion, and I'm particularly happy to see that the podium backdrop is in place, even if, for the time being, it is a rather dull black. I'm tempted to head on up for a better look, but the mirrored sunglasses guy standing near the bottom of the steps makes me reconsider. Instead, I amuse myself by wandering along the pitlane. 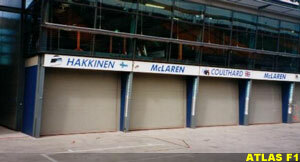 The drivers and team names have been painted above the relevant garages, and in one short stroll it is possible to relive the fortunes of each team during the 2000 season. The pitlane still bears the marks from last year in the form of painted lines that mark where each team's drivers were expected to halt when they came in for their pitstop. Some still carry long black grooved tyre marks - legacies of desperate efforts to rejoin the race without losing excess time. Sprinklers frantically spray water all over the grassed areas alongside Lakeside Drive, trying to keep the grass green in the face of an oppressive Melbourne heatwave. The theory behind this is that it will help make the track surrounds look more appealing on television. Come race day though, this particular area will be so full of people that the grass will be invisible to the television audience, and trampled to death. Still, it's a nice thought. If by some miracle when you are watching the race you happen to see a patch of grass in the spectator area near the chicane, be sure to acknowledge how lush and green it looks. The organisers have gone to a lot of trouble. Elsewhere on the circuit, the barriers have all been installed and treated to a fresh undercoat. The 2001 advertising has not been added yet, though I seem to remember from previous years that this is usually done quite late. 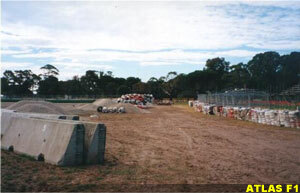 Some of the gravel traps are now under construction, with the large runoff area at Turn 12 being closest to completion. The road at Turn 4 has now been adapted to race configuration, and for the first time it's possible to drive through Turn 4. The Turn 9/10 chicane is under construction, but still appears to be a couple of days from completion. All the overpasses are in place, and most have already been painted up for this year's race. On the surface, the circuit now mostly looks, well, like a Grand Prix track. There is still work to be done, but all the major pieces are now in place. Some of the entry gates have been built, and circuit maps and signage are scattered throughout the park. From the pitlane, it looks like the Paddock Club is coming along nicely, though Mr. Mirrored Sunglasses won't let me get close enough to investigate further.